In the first part entitled "The Last Act" of this Shadows article series we looked at what the Bible has to say in Revelation chapters 7, 9 and 20 concerning the incredible persecution believers will endure during the 7-year Tribulation. Those believers who will come to know the Lord as Savior after the Rapture will suffer terribly. We looked at the reason why the Tribulation Saints will be hunted down and slaughtered by the millions — they're used as scapegoats for the wrath God will beset upon the planet, their refusal to take the Antichrist's loyalty mark, and primarily because Satan hates those who follow Jesus Christ. We asked, "Was the cost worth it?" The scene of joy displayed by the worshipping martyrs in heaven and the love and protection God will provide them eternally leaves the reader to only conclude emphatically — "Yes!" Now we'll explore what the persecution of believers during the Tribulation will look like. I don't think we have to look too far past the daily headlines of today to see shadows of the Christian persecution to come. 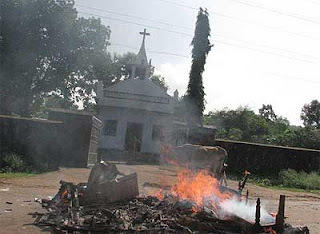 For our first look into the nightmare world of Christian martyrdom, let's focus on the country of India. The following is a current report from a missionary in India working with orphans. "We have never seen anything like this. We knew that Orissa was the most resistant and hostile State in India as far as the Gospel is concerned. And we brushed off the continuous threats and harassment we faced as we went about His work. But none of our staff imagined that they would see this kind of carnage. Let me explain. A militant Hindu priest and 4 of his attendants, who were zealously going around the villages of Orissa and 'reconverting' people back to Hinduism, were gunned down by unknown assailants in Central Orissa last weekend. Immediately the Christians were blamed. The cry rose up, 'Kill the Christians!' And the horror began. 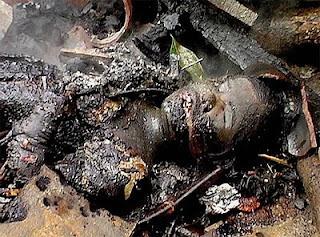 In the past 4 days, we have first-hand witness to hundreds of churches being blown up or burned and many, many dozens of Christian tribes have been slaughtered. For no other reason than they bear the name of Christ. Night and day I have been in touch with our Good News India Directors spread across 14 Dream Centers in Orissa... they are right in the middle of all this chaos. In Tihidi, just after the police came to offer protection, a group of 70 blood-thirsty militants came to kill our staff and destroy the home. They were not allowed to get in, but they did a lot of damage to our Dream Center by throwing rocks and bricks and smashing our gate, etc. They have promised to come back and 'finish the job.' Our kids and staff are locked inside and have stayed that way with doors and windows shut for the past 3 days. It has been a time of desperately calling on the Lord in prayer. More police have come to offer protection. In Kalahandi, the police and some local sympathizers got to our dream center and gave our staff and kids about 3 minutes notice to vacate. No one had time to even grab a change of clothes or any personal belonging. As they fled, the blood-thirsty mob came to kill everyone in the building. We would have had a mass funeral there, but for His grace. 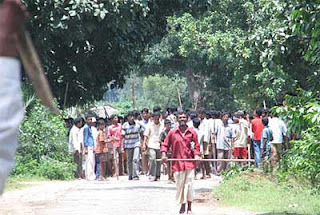 In Phulbani, the mob came looking for Christian homes and missions. The local Hindu people, our neighbors turned them away by saying that there were no Christians in this area. So they left. We had favor. The same thing happened in Balasore. All our dream centers are under lock down with the kids and staff huddled inside and police outside. The fanatics are circling outside waiting for a chance to kill. Others were not so fortunate. In a nearby Catholic orphanage, the mob allowed the kids to leave and locked up a Priest and a computer teacher in house and burned them to death. Many believers have been killed and hacked into pieces and left on the road... even women and children. At another orphanage run by another organization, when this began, the Director and his wife jumped on their motorbike and simply fled, leaving all the children and staff behind. Every one of our GNI directors that I have spoken to said: 'We stay with our kids.... we live together or die together, but we will never abandon what God has called us to do.' 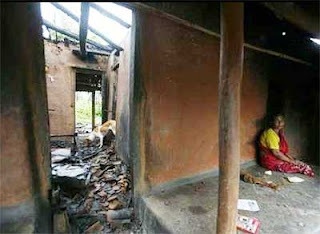 More than 5000 Christian families have had their homes burned or destroyed. They have fled into the jungles and are living in great fear waiting for the authorities to bring about peace. But so far, no peace is foreseen. This will continue for another 10 days... supposedly the 14 day mourning period for the slain Hindu priest. Many more Christians will die and their houses destroyed. Many more churches will be smashed down. The Federal government is trying to restore order and perhaps things will calm down. We ask for your prayers. Only the Hand of God can calm this storm. None of us know the meaning of persecution. But now our kids and staff know what that means. So many of our kids coming from Hindu backgrounds are confused and totally bewildered at what is happening around them. So many of their guardians have fled into the jungles and are unable to come and get them during these trying times." You'll notice that the assassination of a prominent Hindu leader is immediately blamed on the Christians, even though world news reported that the Hindu leader had many enemies within his own faction. With a "viable" excuse now in hand, the mob feels it now has justification for acting out on its hatred of Christians. A mob is formed to provide group strength. The mob lets loose atrocities upon the Christians, involving no discernment for women and children, attacking the very people who have helped their neediest — the orphans. The executions are not remotely humane but involve torture. The democratic governing authorities do little to stem the mob's unlawful rampages, letting the mob act out for them so as not to get their own hands dirty. Please heed the missionary's prayer to "uphold all this in fervent prayer." 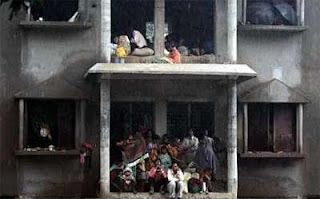 You can learn more about the persecution of Christians in Orissa, India at Persecution Update India. 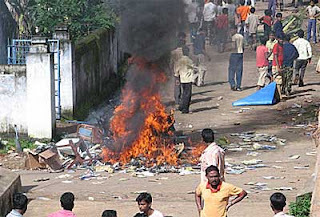 But, as much as this scene in India makes one heart-sick, image it on a global scale. In the Tribulation, believers in Christ can expect the same treatment that this scene foreshadows. As the only righteous opposition to man's evil desires, believers will be hated. The judgments upon the planet for man's wickedness will be blamed on believers and Jews. This will give the unbelieving population the motive to attack. The Antichrist's government will at first look away from the atrocities, but when the believers don't comply with his loyalty mark, the Antichrist will legalize the wholesale persecution of the Tribulation Saints. With persecution on a global scale, the Tribulation Saints will have nowhere to find asylum and will die horrifically by the millions. Note: If you are a believer who happens to come upon this article during the Tribulation, there is one place you may find some semblance of protection — Israel. God will protect Israel up until Jesus' Second Coming. Most of Israel will be destroyed and two-thirds killed, but there is your best chance of surviving to the end of the Tribulation. In the next post, we will look at another shadow of the persecution against Christians that is to come. Nathan, In the future please link to the graphic photos instead of posting them without warning of content. Is it not possible youngsters could visit this blog? Thanks. A picture really does say a thousand words. It can move someone from concern to action. A picture of a child enslaved moved my 7-year old daughter to pray for the plight daily and post a picture on her wall - all on her own. That may be, but would you REALLY put that picture of a charred dead body in your daughter's room???!!! Thanks for the pictures. Truth is truth, and we should all prepare ourselves to reality and hide from nothing.